Leighton Meester Online (l-meester.net) is the unique and most extensive source online about the talented actress, Leighton Meester. We provide you the latest news, photos, videos and much more about Leighton. Check out this site! LANAFAN.COM – New Main & Gallery Layouts! We’ve very pleased to with the outcome of Lanafan.com! Thanks to Sin21.org Designs for the amazing set-up with the addition of our very own coding and graphics. We are also excited about the out come of our gallery layout as well! We’ll be updating our gallery with tons of Lana Del Rey photos from over the years, stay tuned for that! We have plenty of exciting additions on the way to Lanafan.com! We’re also looking for elite & top affiliates to fill in. You can like our facebook fanpage ! And visit our Coppermine Gallery ! After working on the site for months on end, Lanafan.com has officially opened! Songstress, Lana Del Rey recently shot up to #1 on Billboards hot 200 with latest release ‘Ultraviolence.’ Over at Lanafan.com we aim to bring you a fresh new Lana Del Rey fansite and provide you with all the latest Lana Del Rey photos, news and updates! We are extremely excited to announce our opening as we’ve had plenty of great feedback thus far. Check out Lanafan.com and bookmark us to keep updated with Lana Del Rey! FlaGaLine.net, the first and only fan site for Florida Georgia Line! 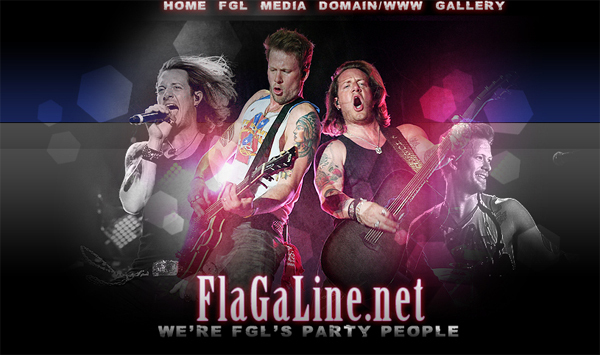 FlaGaLine.net is the first and only fan site for country duo Florida Georgia Line. After releasing their debut single “Cruise” in 2012, FGL has blown up the country and Top 40 radio stations with hit after hit. The duo plans on releasing their follow up album to “Here’s To The Good Times” in fall 2014 and are riding the wave of success of the album’s first single, “Dirt”. Please visit http://flagaline.net for information on Tyler and Brian, hundreds of videos, lyrics to all of their songs and up-to-date news. Leave a comment in our news posts to chat with other FGL fans, and visit our comprehensive photo gallery with over 7,000 photos! We are also looking for great fan sites to partner up with for Elites and regular affiliates, so please email admin@flagaline.net if you are interested. 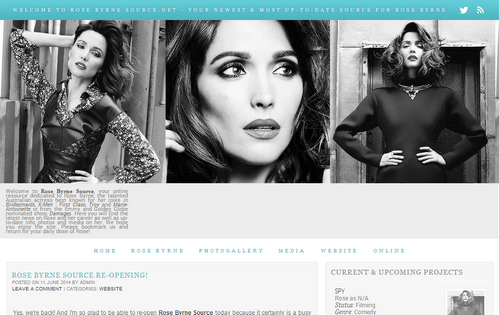 Rose Byrne Source now hosted by Flaunt! Arrow France is finally opened ! Arrow France is your best fan site for everything about Arrow and his cast. It features the largest Arrow gallery on the net. Website Affiliates are being accepted at the moment you can send an application any time, Thank you ! Portal Megan Fox your daily resource about the Teenage Mutant Ninja Turtles star has a new layout! Be sure to check our site and our gallery, and follow us on Twitter, Tumblr, and like our Facebook page! William Levy Source is finally opened thanks to the professional help of Simply Sparkly Designs whom created the matching WordPress and Coppermine theme for the site. WLS is the ultimate fan site for Cuban actor and former model William Levy. It features the largest William Levy gallery on the net as well as the only site with exclusive HQ candids. Website Affiliates are being accepted at the moment you can send an application any time, Thank you! Adelaide Kane France Gallery has a new look! The gallery of Adelaide Kane France has a brand new look! With 26,600+ HQ and MQ pictures, our gallery is the largest and most up-to-date Adelaide Kane photo gallery online! We have a new look up at our gallery SelenaGomezGallery.Com after five months we decided to change up the look. We love the new look and hope you do too! Please come and take a look Selena Gomez Gallery is your best source for HQ photos and exclusives of Selena Gomez. It’s a part of SelenaMGomez.BZ thank you!